While I wait for some parts to arrive to start on the Apache project I figured I would fix this quad up real fast to have another one around to ride on. This was originally aquired in a group of quads I got free off craigslist a while back and had been sitting in my basement for the past 6 months. 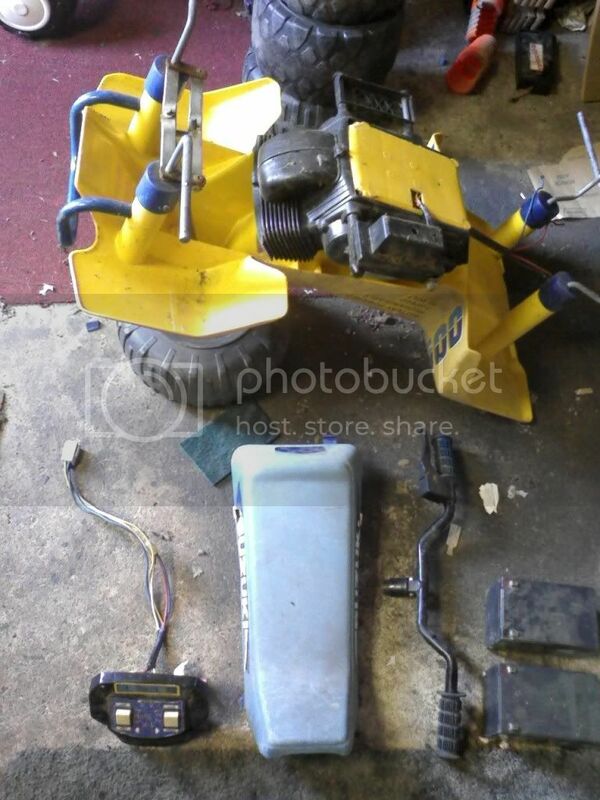 This one had been modded with #7 19T gearboxes when I got it, and also had been used with a lawnmower battery. The wiring harness was all hacked up, so I tossed it when I tore it down. 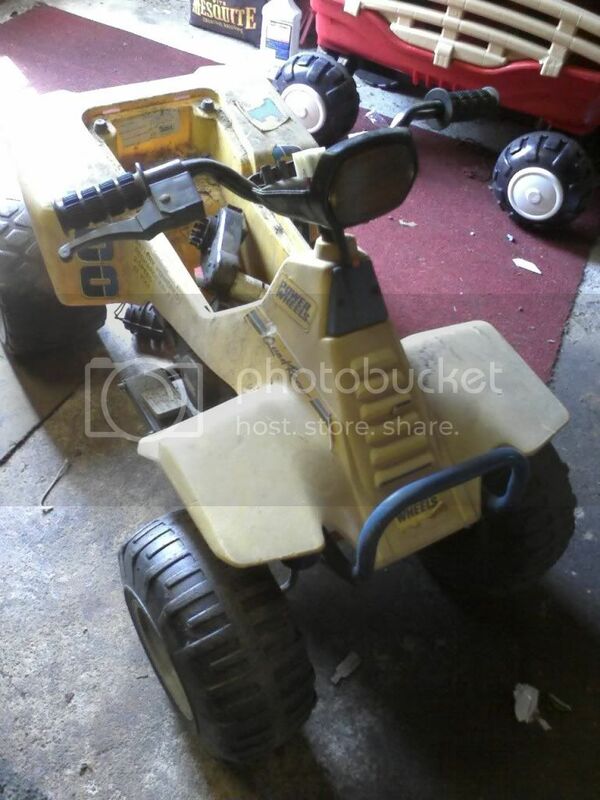 This Suzuki Quad came with it, so it was stripped of everything still usable and then scrapped. 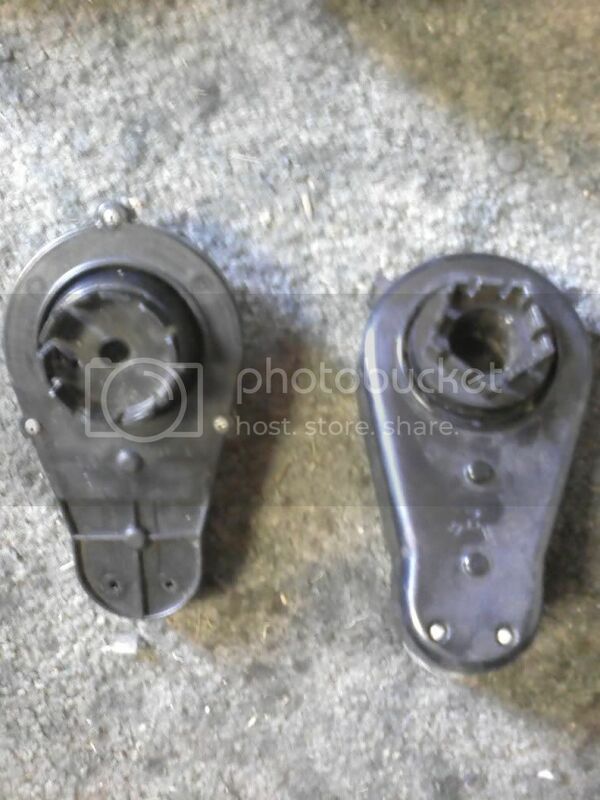 The gas pedal will be used to make a seperate brake pedal, and I'll wire in an on/off switch for it � la cfanto's army jeep. The gearboxes and motors were working, but both gearboxes had holes and cracks in them, so they were pretty dirty inside. I tossed the gearbox housings and kept the gears as spares. I will be putting 19T gearboxes on from one of the McQueens. I tore it down this past weekend and stripped all the rust off the metal parts. Some of them were pretty bad, like the rear axel, so that was tossed. I'll be using the rear axel off the other Suzuki quad as a replacement. All of the metal parts were cleaned and painted. 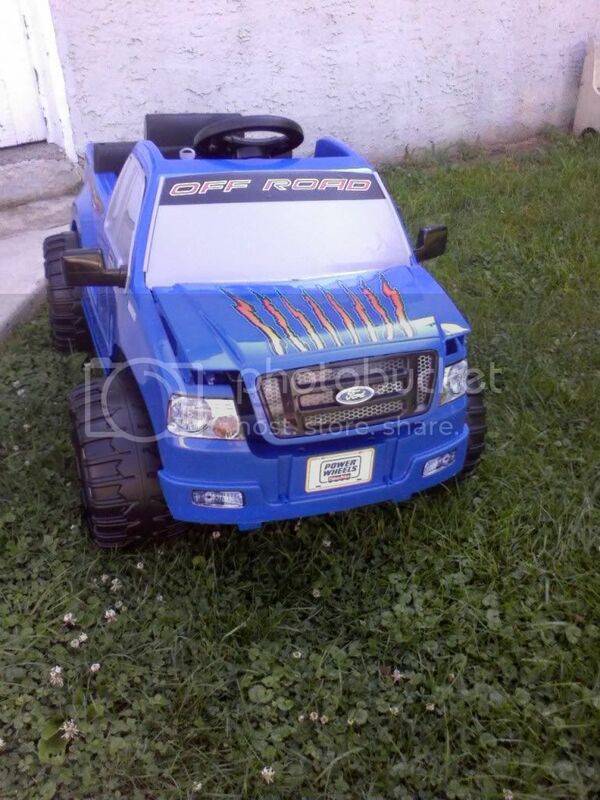 I'm going to put some Big Foot wheels I have on it instead of the wheels it came with (those were traded to Wheres). That should give it some good traction for my backyard. I still need to clean up the plastic parts before it goes back together. Unfortunately I have to travel out of town for work next week, so this one might not get done as fast as I had hoped. Got the Suzuki finished up tonight. I decided to go with Super 6 Motors on this one, so it's on 12V now and since the batteries are switched from parallel to series, it'll have posi-traction all the time. I installed the seperate brake, and put the on/off switch on the underside. I really like the seperate brake function, and I hope Olivia will be able to learn how to use it. Once I get some steel angle rod, I plan to remove the 8T pinions on the Super 6 motors and put some 19T pinions on them so I can use the beefier #7 gearbox on this one. I had wanted to put the bigfoot wheels on it, but the front axels were too short for them, so that idea has been put on hold for now. Is this where the super 6 went? Sure is. It was a little squeeky at first, but some motor oil smoothed that out, so I'm hoping it holds up ok. Was originally planning to do this one 18V, and the Green one Super 6, but the wiring harnesses on each kind of made more sense this way. Olivia took the Suzuki quad today and loved it! She kept it going until a wire popped off one of the motors. By that time it was a scortching 90 degree and I was getting fried, so we decided to come in and cool off. Yea, she told me she didn't want to use it yet. One thing about the brake pedal though, even when I have it turned off, it still cuts power when she steps on it, so I may have to check the wiring. The only thing the on/off swich seems to do is turn on or off the auto brake from the gas pedal. Quads are the best, yours looks good nice work! Amazing to see the transformation... That one looks about like my Green Ninja does. One of these days I'm going to actually get around to cleaning it up. Too many other projects to worry about actually making one look nice! What did you do about the Hi/Low issue? Did you rewire everything or just say to heck with it and run it in high gear all the time? I'm trying to decide what to do with mine... My son won't ever use low, but my daughter will be needing it eventually! Actually I didn't have to anything about the Hi-Low issue with this one. Since the original wiring harness had pretty much been hacked up beyond recognition (there wasn't even a F/R switch in place), I found a complete new one on Ebay and ordered it. It came with new switches and all. It was set up to run 2 6V Batteries in series for High and in Parallel for Low, so I figured with that set up I would just use the super 6 motors for the speed increase and keep it at 12V. My daughter is the same way about speed now, she never uses Low anymore, and if it does get switched into low, she'll either tell me it needs recharged or figure out it was switched to low and switch it back. I do have to say this was a pretty straight forward and easy restoration. It was a lot easier to take apart and put back together than the newer style quads. The only mod I did was for the seperate brake pedal, which Olivia still doesn't want to try yet. The only reason it took me a while to complete was finding the time to actually work on it. All told, I think I only spent a days total time to get it done, most of that waiting for paint to dry. Just a quick update. Got the mud flaps from Colinandmyles mom today and put them on just to add the finishing touch. All in all I really like this quad. It's very simple, but works great and feels a lot sturdier than the Ninja quad. We have one just like it and it is one of Bugs favorites.It has been running with super 6's for some time now and does really good for drifting or do-nuts. Connor and Olivia were racing around on the quads awhile today. One thing I noticed, since both quads have the same size wheels and same 3B gearboxes and approximately the same weight on them, is that the Super 6 Motors on 12V seem to run just a hair faster than the standard motors on 18V on flat surfaces. BUT as soon as they start going up an incline the torque provided by the 18V kicks in and it jumps way ahead of the Super 6 motors. I'm acutually finding the same result with the Duratrax 5737 motors on 12V VS 18V standard motors in the two McQueens. 18V provides much more torque to the wheels and really pays off going up hill. Anyway, here's a quick video of them racing around a little today. Thanks for the info. I asked Grant but he didn't have any super 6 rides. I was going to ask you that question. I think that information should be sticked! LOL! I couldn't help but notice in the first video. I'm glad to see that I'm not the only one that has "roads" of trashed grass around their yard! I have a few spots on turns where the grass won't even grow anymore. Once it finally started raining here, the "road" area pretty much disappeared to my surprise, but I'm sure it'll be back again when the hot dry days of summer get here. Well just for the heck of it, I put some 3A gearboxes on, and man the torque loss is tremendous. Even on fully charged batteries it really struggled to get up the hill and made it seem like the batteries were dead, so I'm putting the 3B's back on it. I may try the 3A's on the 18V Ninja quad to see if the 18V can make up for the loss of torque on it, or if it dog's down as well. This quad is still currently the favorite, and it ridden just about every day that's not raining (which hasn't been too many lately). That runs on grass great! Some of the #3 gearboxes have a "2" on them, but they are still #3 gearboxes. The two kinds of #3 gearboxes are the 3A (Round output driver) and 3B (Pentagon output driver). Unfortunately neither of them is very strong, but I would use the 3B to get some extra torque out of it. I do have an extra set of Super 6 motors for the #3 gearboxes if you want. Yep! That's Exactly what I have..But both of the #3 w/ The Pentagon outputs seem to be in good shape so I will use them until I come across better ones. I have no motors so a pair of super6's for the quad would be great! Let me know what you want for them. Thanks for the help! I just started pulling it apart. You know the one thing I never found out is what the real old #3 style gearboxes, like the one you have here shown on the left, are as far as Final output ratio. I do have a single one of them if you'd like it as well. How about $14 shipped for the two Super 6 Motors, and if you want the gearbox too, just make it an even $15. Deal! I will take both motors and the extra old #3 pentagon GB for the $15. Let me know how you would like the payment or if you have PayPal. I will be away tonight but will check back tomorrow morning to find payment info. Thanks again. I will let you know how the super6's work with the old #3 GB's and post a video. It is flat around this part of PA so I'm just looking for more speed not as much torque. Hey on a side note. I have 2 12V 12Ah Sealed Lead Acid's from a electric scooter. I'm thinking that battery should do fine? What do you think? Yep should work great! Good Luck and let us know how it works out. gseric69 did you mean the gearbox on the left! Ha, yes. I still can't tell my right from left sometimes. I got a few parts from Shadowless_Nite so now it doesn't look as plain as it used to. I used Chrome tape to make the headlight lense and it turned out really well. Now I just need to find some nice racing stickers to add. Since the Super 6 motors tend to drain 12AH batteries faster than I like, I decided to get a pair of 6V 20AH batteries to use. So far so good, I just need to make a hold down bracket for them now since they are a lot bigger that the 12AH batteries. Eric did you use a resistor on your brake? I was going to remove mine from the wiring harness. I removed mine as well. Not yet, the 3B's I have on this one are holding up well so far, which I suppose is due to the lower torque the Super 6's put out on 12V compared to a 12V motor on 18V. The 3Bs in my 18V Ninja Quad just went out the other week though, so I'm going to be looking into finding a better replacement for those first. The 16T gearbox is a slower GB than the 3B (which is comparable in speed to the 19T #7) so it may seem a little slower if you put them in with the 12V motors on 18V, compared to the speed the Super 6 3Bs put out. You'll have much more torque though, so that might be handy off-road and on hills. Alright. I have to check and see if the 16T gearboxes fit on the quad without having to mod anything.